Are you as patient as a great blue heron? These beautiful birds are quite abundant in New Hampshire (and North America), so if you spend any time at all on our ponds and lakes, you're very likely to see one. And considering its size -- about 4 feet tall with a 6-foot wingspan, you really can't miss it. Two interesting facts about their behavior: Great blue herons are typically very patient (or lazy, depending on how you look at it) -- they quietly wait for their prey to come by before striking with their bills. You might say they're a little stupid, too. They swallow their prey whole and have been known to choke to death because they've swallowed something just a little too big for their long slender throats. Apparently, they're not fussy eaters. They will consume anything from large fish to frogs, mice, small birds, and insects. When you're out on our waterways, be on the lookout for the herons' rookeries (high stick nests up in the trees) and give them lots of space. A side note on our state's bird population: Thanks to the efforts of conservationists, three birds are being moved from the endangered to the threatened list this year. These include bald eagles, peregrine falcons, and the common tern. Ospreys are perhaps the state's biggest success story. They are coming off the threatened list altogether. There's good news and bad news: I came across the website Pedaling.com, which has lots of cool features. You can search for rides by state, region, trip length, terrain and more. You can even set up a trip planner to take with you. I like all that! The bad news is there aren't many rail trail options listed for New Hampshire. But you just may find something to your liking here. I'm trying to get up the courage to take an on-road trip, somewhere with light traffic. This site lists some good possibilities and may just be the push I need. While we're on the topic of biking...I have a really ambitious trail I'm adding to my wish list. The province of Quebec has a 2,700 mile network of bike trails! The Route Verte, unveiled in 2007, stretches from one end of Quebec to the other, passing through 320 towns--obviously, I'm talking about biking just one tiny portion of it. I first read about this amazing network in the Boston Globe. I think it's fair to say you can see a little of everything along the Route Verte: lakes, canals, farmland, forests, historic forts, churches, and more. There's even one 30-mile loop that's "sprinkled with works of outdoor art." There's a website devoted to the Route Verte if you'd like to read more. Personally, I find that site a little overwhelming since I don't know the area. I prefer reading descriptive narratives like the one I read in the Globe. See you on the trail! We haven't been out biking or kayaking for a bit, but we're always on the lookout for new places to add to our wish list. Tops on our list right now is a bike trail outside of New Hampshire, but one that we've been wanting to try for a while. I just learned this week that the 11-mile Minuteman Bikeway in Massachusetts has been named to the Rails-to-Trails Conservancy's Rail-Trail Hall of Fame. This is a huge deal, since there are only five trails nationwide inducted into this Hall of Fame. When they say this is a busy trail, they're not kidding! Estimates put the total number of all users (cyclists, joggers, skateboarders, etc.) at two million people annually. This 12-foot-wide path is used for both recreation and commuting -- what a wonderful option with today's high gas prices. Minuteman Bikeway passes through parts of Cambridge, Arlington, Lexington, and Bedford-- and is noteworthy for its historic sites, including some of the Revolutionary War's earliest battle sites. You can read an excellent article about this award-winning trail on the Rails-to-Trails Conservancy website. You can also learn more by visiting the Minuteman Bikeway's official website here. If you've biked this trail, why not send us a comment and let us know what you found? Unfortunately, it doesn't look like we'll have time to go kayaking or biking this week. (We're in the midst of a major kitchen remodel...lots of decisions to be made and workmen to boss around.) But I am planning to take breaks occasionally to share information with you about some of our previous paddles. First on the list is Dubes Pond in Hooksett. It's hard to believe when you're out on Dubes Pond that you're just a short ten-minute drive from Manchester (our largest city). When Doug and I kayaked here on a weekday in July 2007, we saw only one other boat. There's limited shoreline development and virtually no traffic noise. At first, Dubes Pond seems small, but it actually has a number of coves and islands to explore. 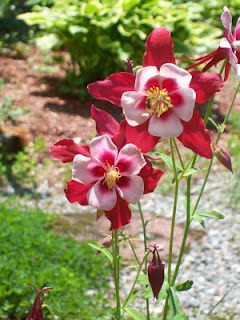 In summer, you'll see fragrant water lilies and lots of other water plants. 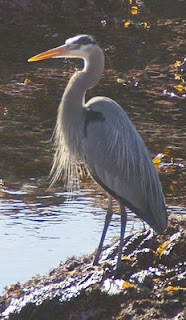 We also saw some great blue herons and a large heron rookery at the far end of the pond. (Please keep your distance from the rookery, particularly during nesting season.) While we weren't there at the right time of day to see beavers, we did see some of their lodges. All in all, Dubes Pond is a great way to spend a few peaceful hours on a summer's day. For me, it's one more reminder of the natural treasures that are so close if we just take the time to look around. Things to Know Before You Go: There's a small picnic area at the boat launch. As you first set out on the water, you may see flags or buoys set out for water skiing. Once you get past those, you should be on the lookout for granite boulders...Dubes Pond has quite a few. Directions: From Manchester, take Routes 3/28 north and turn right onto Route 27. The boat access is on the left, 2.3 miles beyond the junction with Bypass 28. You can drive up to drop your boat off and then park in the lot across the road. Note: I published a slightly different version of this article on www.paddling.net. Be sure to check them out for some great trip reports from other kayakers. 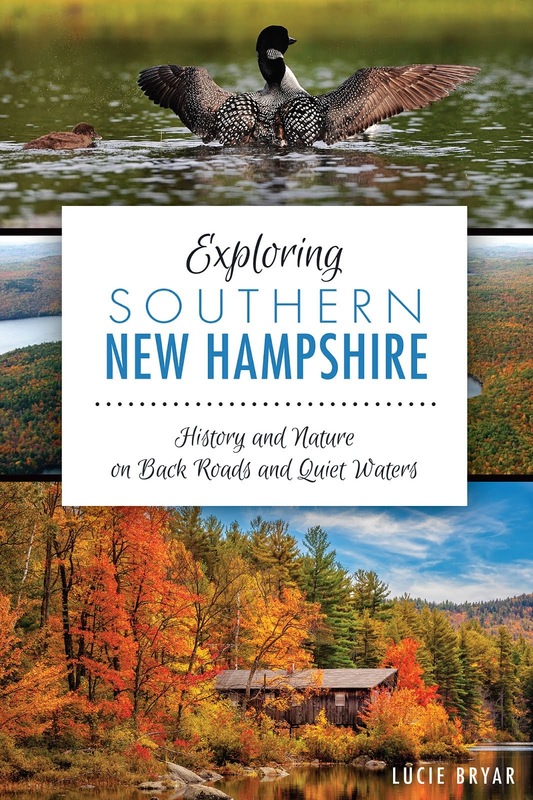 A very rainy Friday here, so it seems like a good day to share with you a couple of New Hampshire blogs that are worth checking out. First, Kim from Enfield, NH has a great blog about stillwater kayaking and avoiding weekend congestion on the waterways. Her philosophy is a lot like ours...she's looking for peace and tranquility on the water, not looking to dodge motorboats. Kim often kayaks with her shetland sheepdog Sadie and asks Sadie to rate the paddle experience (one paw, two paws, etc.). It's too cute! Of course, Sadie's ratings are based on if she's able to get out of the boat and run around a bit. Check it all out on www.go-paddle.com. I almost feel like a traitor writing this...but Burlington (Vermont) is a recreational bicyclist's paradise. This beautiful lakefront city offers lots of reasons to plan your first visit or start daydreaming about your next trip back. We're talking easy biking--nothing competitive, too fast or challenging. As someone commented about the Burlington Bikeway, "It's for families and folks who haven't been on a bike in 50 years." Well, that's just a slight exaggeration. (It hasn't been 50 years!) We pedaled here on Monday and did see a few more competitive, experienced types,too. For starters, there are multiple bike rental shops in the area and numerous access points to the trail. The bikeway is mostly all paved, very well maintained, and well-marked. The 12-mile trail offers great waterfront views of Lake Champlain from Burlington to Colchester. And then there are the beautiful Adirondack Mountains on one side and the Green Mountains on the other. One of the things I loved best about this trail, apart from the spectacular scenery, were the wonderful scents filling the late spring air. Lilacs and a fragrant white-flowering shrub mingled with the smell of freshly mowed grass. The Burlington Bikeway isn't the only opportunity in the area. Apparently there's another trail that takes you around the city's somewhat hilly streets. The Bikeway also connects with the Cross Vermont Trail, and a trail that eventually takes you all the way to Montreal! Things to Know Before You Go: Keep in mind you'll be sharing this multi-use trail with runners, walkers, and inline skaters. There are 5 miles of trail in Colchester (at the north end) that are unpaved and not recommended for street bikes.